In case you were wondering if there’s anything Alex Zanardi can’t do, well … there probably isn’t. The former CART champion and paralympic gold medalist received an invitation to test BMW’s DTM car to celebrate the 40th anniversary of its M-line and passed the test with flying colours. 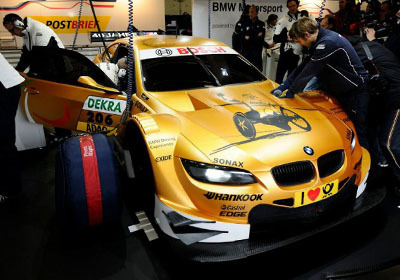 The BMW M3 DTM was painted gold in honour of Zanardi’s recent achievements at the Paralympic Games in London, where the Italian took two gold medals in the handbike events. Zanardi used to compete in the European and World Touring Car Championship for the German constructor, taking four wins. Zanardi took to the track for 32 laps around the Nürburgring grand prix circuit in a modified DTM machine, braking with his prothesis leg and controlling the throttle manually on his steering wheel. Zanardi all but ruled out a return to racing, but he’s as keen as ever to focus on new challenges in the future. “I am delighted we have taken on this adventure successfully with Alessandro Zanardi,” BMW Motorsport director Jens Marquandt says. “For years he has been a valued member of the BMW Motorsport family and is a great role model for us all. Despite his handicap, he approaches every challenge with great optimism and passes every test with flying colours. The question just remains which obstacle is next for Alex Zanardi. And how he’s going to overcome it. Because that’s exactly what he is going to do.